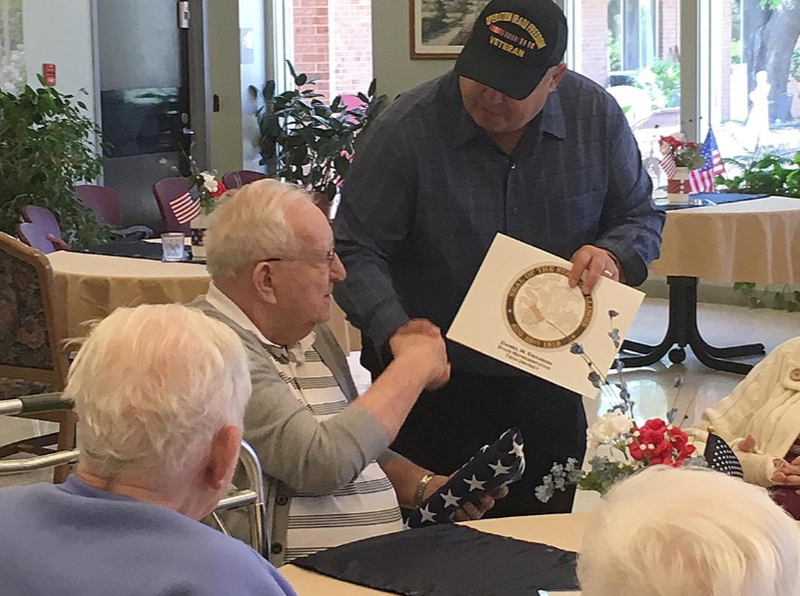 KNOXVILLE — A dozen military veterans who reside at the Knox County Nursing Home were presented with gift bags Monday. Elks Lodge Post 894 received a $1,500 anniversary grant — it is the 150th year for the local lodge — and decided to create personalized bags for the 12 veterans who live in the county-operated facility in Knoxville. The bags included items specific to each person, but included flannel bed sheets, electric razors, food items, facial tissues and some even received a stand with a new birdhouse. State Rep. Dan Swanson, R-Alpha, emceed the event and asked where every veteran in the room served. Swanson, a veteran himself, went on to thank each man personally for his service after the bags were handed out. Jorja Thiel, the exalted ruler of the Galesburg Elks, said it was the first time they’ve been able to do this event and the same grant could be available next year as well. The Elks serve a variety of area towns, including Monmouth, whose Elks lodge closed, and put on a number of community events. Among the dozen veterans given bags Monday, there was a mix of Army, Navy, Marine Corps and Air Force. One of those was Navy and World War II veteran Glenn Paulsgrove, who was found to be the oldest veteran in attendance. He said he helped transport troops to the Philippines during WWII. Swanson presented him with a U.S. flag that had flown above the Capitol in Springfield and had a certificate of authenticity. “It was all of you in here that were willing to put on the uniform and serve for us,” Swanson told the crowd.